This is a high and holy calling, and effectiveness is dependent upon the power of the Holy Spirit. 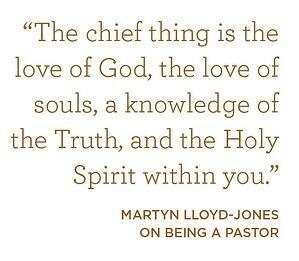 October is Pastor Appreciation Month, which makes it a fitting time to reflect on just how foundational and essential the Holy Spirit is in pastoral ministry. The Spirit of God working within and through a pastor is necessary for his message to come from the Living God and not from a mere man. Prayer plays an important role in this endeavor, providing both insight and encouragement. It’s a comforting reminder to all of us that we can trust entirely on the Spirit of God to do the work of God through the Word of God in the lives of those with whom we share the gospel—regardless of the giftedness of our exposition. Along these lines, your prayers matter too! Asking God often for your pastor to both proclaim Christ boldly and to embody Christ’s humility will uphold all his efforts and serve as a great encouragement. I’m immeasurably grateful for the letters I regularly receive telling of prayers offered on my behalf. I assure you, I need them! And your pastor and elders do, as well. Even Paul was never shy to ask for “supplication for all the saints and also for me, that words may be given to me in opening my mouth boldly to proclaim the mystery of the gospel” (Ephesians 6:18–19). If you’d like to support your pastor with helpful resources this month, we have several available. Our book offer in the first half of the month, ReSet by biblical counselor David Murray, provides a great deal of wisdom and practical advice for avoiding burnout while ministering to a congregation, raising a family, and nurturing a marriage. Also, our full audio series, titled The Pastor’s Study, is a comprehensive seven-volume study that encourages pastors to preach Christ with courage, clarity, conviction, and compassion. Many of the messages in The Pastor’s Study originated at our annual Basics conferences. The entire series comes on a USB drive. Thanks to your faithful giving, extensive studies like this one are available without any price markup and can be purchased for just the cost of production. Your essential partnership with Truth For Life undergirds all we do! Thank you.